There is nothing more American then sitting around a campsite in a national park with your family roasting smores over the campfire while grilling burgers and hot dogs on the grill. Experiencing the outdoors with your family and friends is a great pastime. Mother Nature is a beautiful place so why not spend more time with here? Of course, one of the best parts about camping is the food. And we’re not talking about the freeze-dried backpacker meals that you just add water to and instantly you have a meal. We’re talking about eggs, bacon, hamburgers, and steaks – all the classics! Yum! Some campgrounds have small charcoal grills at each campsite, but you can’t be sure they are reliable and functioning. A portable grill is a great investment is you enjoy car camping. 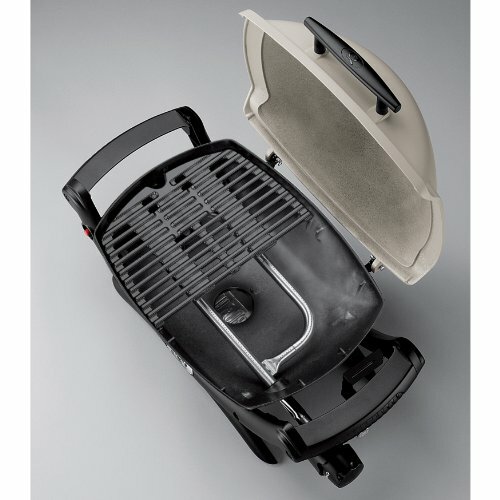 Not only is a portable grill great for camping, but you can bring it to the beach, use it as a second grill for a huge backyard BBQ, or even use it as your primary grill at an apartment complex where gas grills are often banned. The Weber Q 1000 is one of our favorite portable camping grills for multiple reasons. It is a durable and sturdy grill with a top-notch porcelain-enameled, cast-iron, non-stick cooking grate that is east to clean. It’s everything you want in a grilling surface. The cooking surface is 189 square inches making it the largest of our three top choices. The 189 SQ. in. hold a surprising amount of food from vegetables or meat or a combination of both. While we love the cooking surface, the Weber Q 1000 runs a bit cooler than our other favorites and thus it might take a little longer to grill your steak. Despite its low cooking temperature, the temperature is easy to regulate and the grilling surface heats evenly. The Weber Q 1000 has a low center of gravity and is best used on a picnic table or higher surface. The four legs each have rubber feet that help with stability. The grill doesn’t have a lock latch for its heavy lid, but our testers didn’t find it to be a big deal. 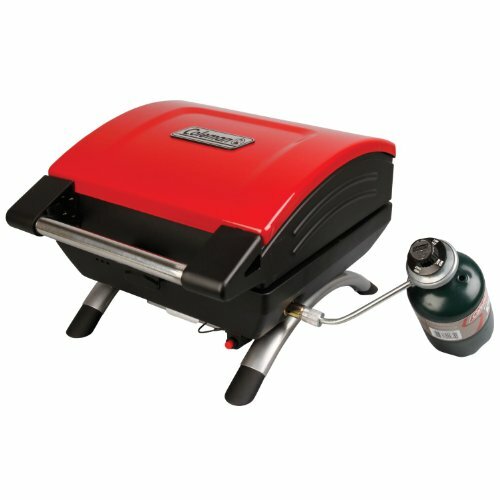 The grill uses propane and lights using a push button. 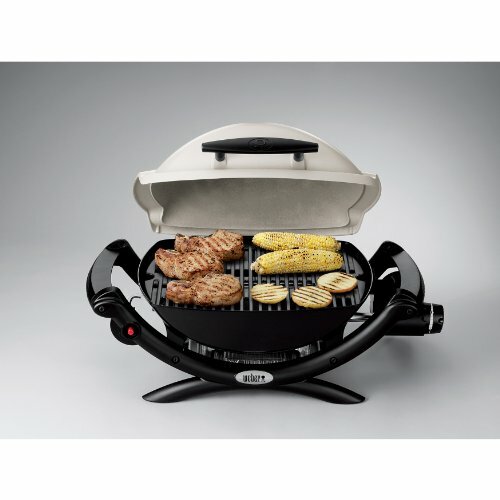 The Weber Q 1000 retails online for $169 (check this listing for the latest live prices). 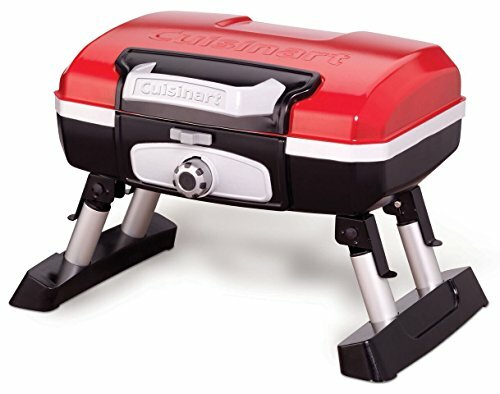 The Cuisinart Petit Gourmet is a low profile, portable, and lightweight grill great for camping. It even comes with its own bag for protection and transportation! The legs easily fold underneath itself and fit flush to the rest of the grill making it easy to carry with one hand while the other hand is balancing the cooler packed full of hot dogs and beer. The Cuisinart Petit Gourmet tends to run on the low side. The grill doesn’t seem to have much of a medium setting. It’s either low or high. The hottest spot of the grate seems to be directly in the middle of the grate, but the grill does grill food evenly. If you’re the impatient type, you might like the Coleman grill better. The cooking surface is only 145 squares inches making it the smallest surface of our top three portable grills for camping. Out of the three grills, the Cuisinart’s porcelain-enameled cast-iron grate is the easiest to clean which is a major plus when you’d rather spend the time roasting smores over a fire instead of cleaning up dinner. The grill includes a little drip tray that attaches to the bottom of the grill. The Petit Gourmet is fueled by propane lit by a simple push button. Unfortunately the only negative about this grill is the push button. Sometimes it takes a few times to light. The grill retails for $150 (check this listing for the latest live prices), but you can often find it on sale for about $100 making it a great budget buy. 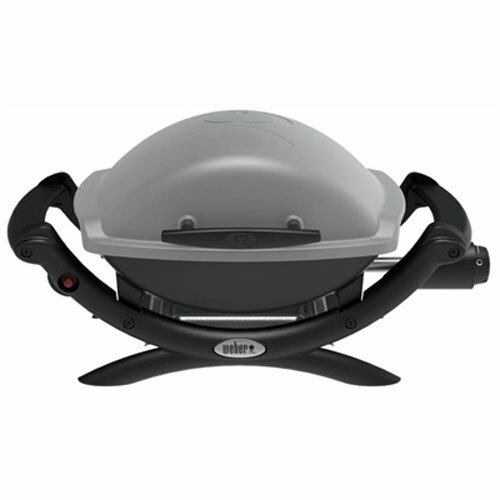 The Coleman NXT 50 is similar to the Cuisinart Petit Gourmet grill. It is light, easy to move with a slightly larger cooking surface than the Cuisinart. The design and the construction of the Coleman are a little odd. The legs stick out at an awkward angle making it less sturdy than the other two grills above and it is noisy when being transported. Additionally when the top lid is open, it rests on the table taking up a lot of space that could be better utilized with food and cooking supplies. The Coleman’s cooking surface is constructed of porcelain-coated stamped steel that is fairly non-stick. The above two grills clean easier than the Coleman, but clean up is still pretty easy on the Coleman. The included drip tray doesn’t quite fit the grill perfectly leading to leaking grease onto the surface underneath. Watch where you place the grip tray or you’ll be scrubbing the picnic table afterwards. The Coleman falls in the middle of the three grills as far as cooking surface size. The grill can hold a fair amount of food.The grill only seems to have one temperature with a maximum output of about 180 degrees. Unfortunately, the cooking surface does not have an even heat source through the surface. Our reviewers found the middle to be the hottest spot with the top left corner as the coolest. A neat feature of the Coleman is the open holes on both the left and right sides of the grate. This feature allows you to cook food similar to a real grill. Food cooks the hottest over the open flame and you can even get grill marks! For about $100 (check this listing for the latest live prices) the Coleman NXT 50 is a good budget option. Weight: 27 lbs. 13 lbs. 20 lbs. Cooking Surface: 189 sq. in. 145 sq. in. 168 sq. in. 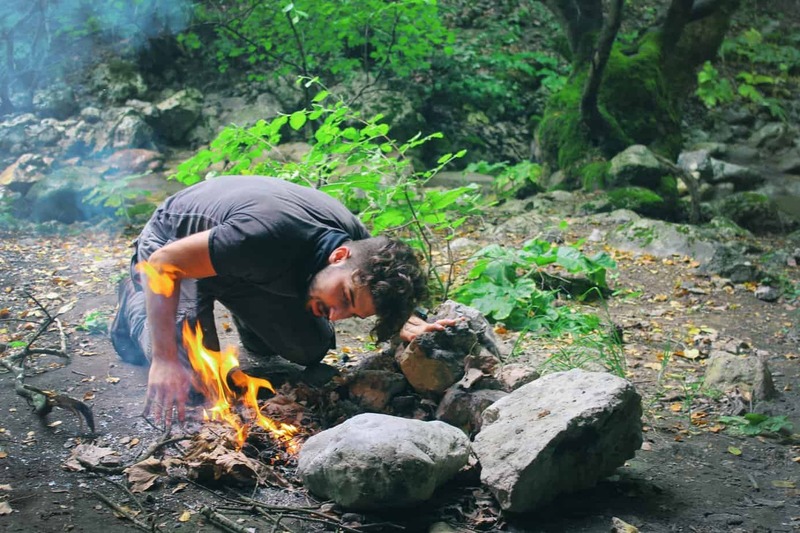 A portable grill for camping can make your trip so much more bearable than eating freeze-dried backpacker meals or managing a hot skillet over an open fire. Thankfully, portable grills are light and compact enough to easily fit in the car. If you have a little extra money to spend and are looking for a large cooking surface, we recommend the Weber Q 1000. It out performed the other two grills. If you’re looking to stick closer to the $100 price point, you’re in luck as both the Cuisinart Petit. Gourmet and Coleman NXT 50 are commonly found on sale online for about $100. Both are decent budget options with positives and negatives. We recommend picking a grill that you’re comfortable using, pack the car, and head to your favorite National Park for your next adventure.